distribution Unlike most of the other clubtails in NC, this species ranges throughout the state, occurring in essentially all counties, though there are no records for a handful of mountain and eastern Coastal Plain counties. abundance Common and widespread. 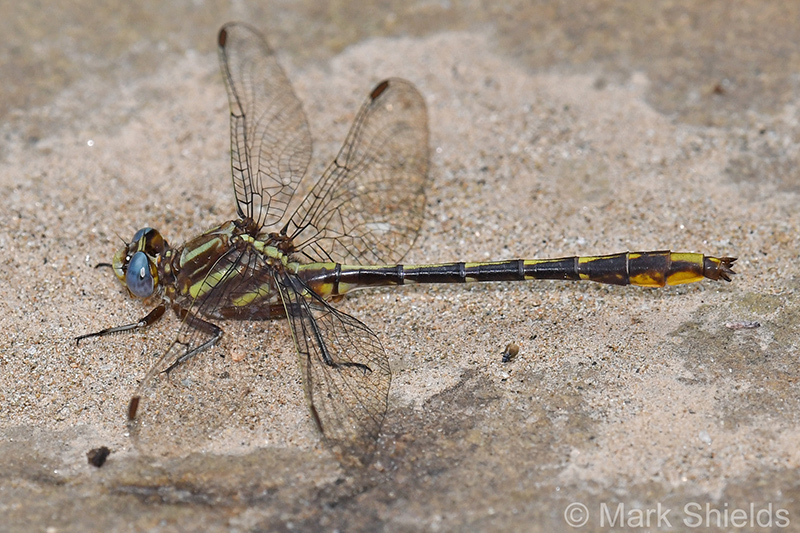 Generally the most common and often seen clubtail over most of the state, especially in the Coastal Plain. Presumably not common in the higher mountains. flight Mainly in the spring. Downstate, from the end of March to late June, peaking in April and early May. In the mountains, the dates are from mid-April to late July, with a peak in early June. habitat Breeds mainly at ponds and small lakes, but also at streams. behavior Adults frequently perch on dirt roads, sunny trails, and other bare areas, often a long way from water. They also perch on low vegetation near water. comments Over most of the state, this and the similar Ashy Clubtail are the most frequently observed clubtails by the average person, as both frequently perch on dirt roads and are rather unwary. Differentiating between the two can be somewhat tricky, though the Lancet is slightly smaller, slimmer, and brighter-colored, among several other field marks. Comment: Alleghany, 2018-06-17, Little Glade Mill Pond at mile marker 230 on the BRP Photo by: John Petranka, Sally Gewalt. Comment: Rockingham, 2018-05-22, Mayo River State Park. Upper pond at headquarters. - Incuding female knocked into water by Unicorn Clubtail, fished out, photographed and released. Comment: Harnett; P, 2005-04-17, Male and female in "wheel"